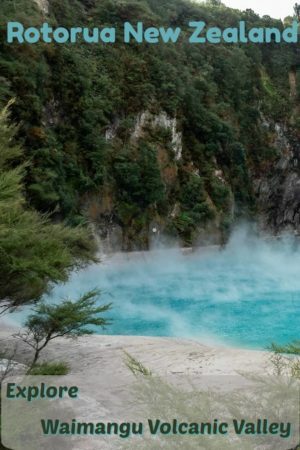 Waimangu Volcanic Valley (New Zealand) draws visitors from all corners of the earth. Photographers come for the colours, tourists for the uniqueness, hikers for nature, and scientists to study the world’s youngest geothermal system. It’s a virtually untouched, ever-changing landscape that was created in just four hours in 1886. 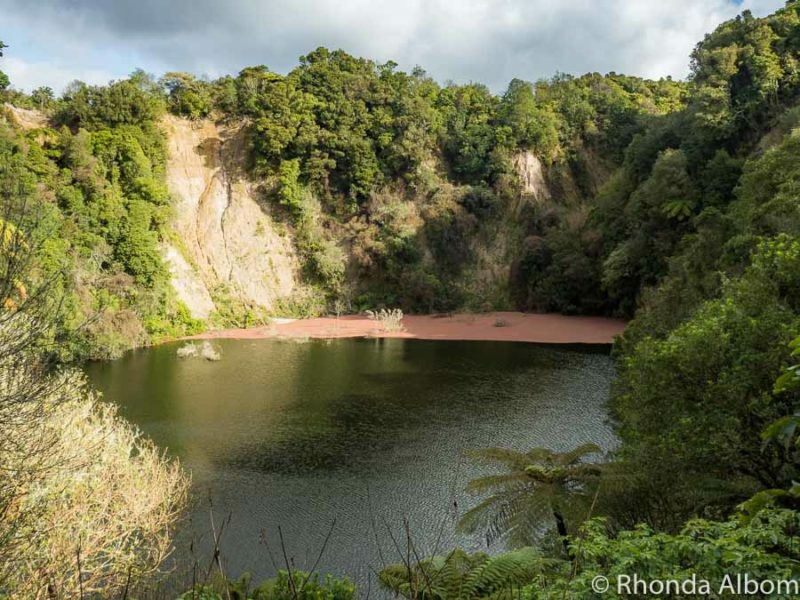 The eruption of Mt Tarawera created this valley (also called the Tarawera Rift), enlarged Lake Rotomahana, and destroyed the famous Pink and White Terraces. At the same time, nature was left a clean slate to rebuild. Looking out over the Waimangu Volcanic Valley. You can see Mount Tarawera in the background, home to the famous volcanic eruption. June 10, 1886 started out as a normal day in the central North Island of New Zealand. 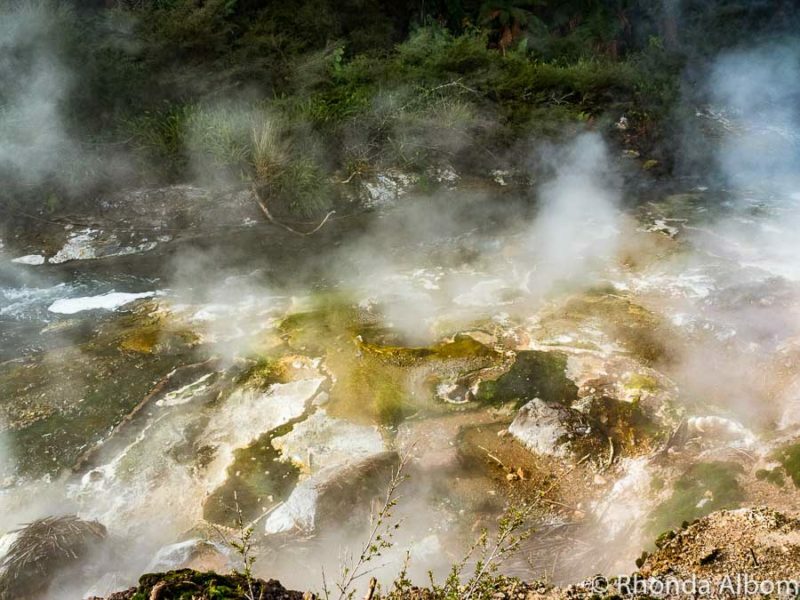 Visitors arrived in what is now the Waimangu Volcanic Valley to see the famous Pink and White Terraces. Suddenly, and without warning, Mount Tarawera exploded in what became the largest recorded of New Zealand volcanic eruptions. In just four hours, everything changed. About 120 people were killed. 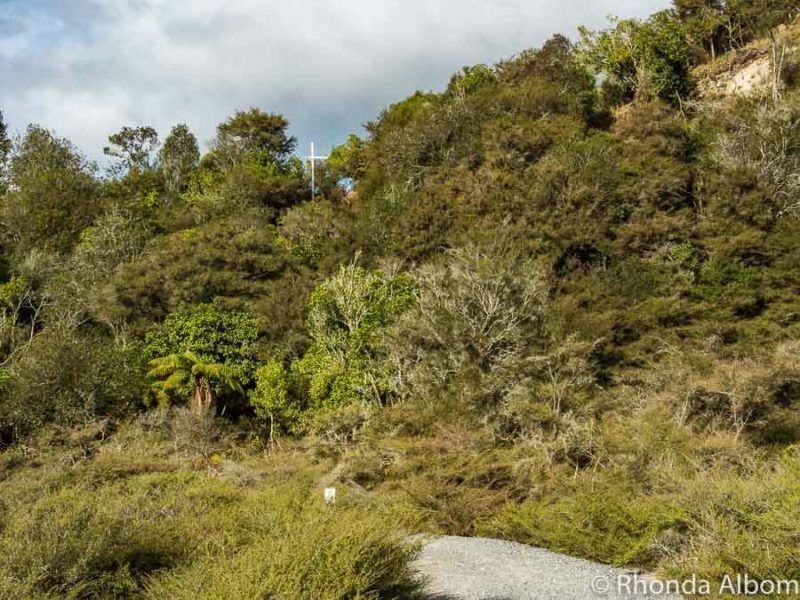 The landscape was wiped out, the 17-kilometre long Waimangu Volcanic Rift was formed, and nature had a blank canvas to regenerate a new ecosystem. Today, scientists (and everyone) who visits get a window into how the world began. 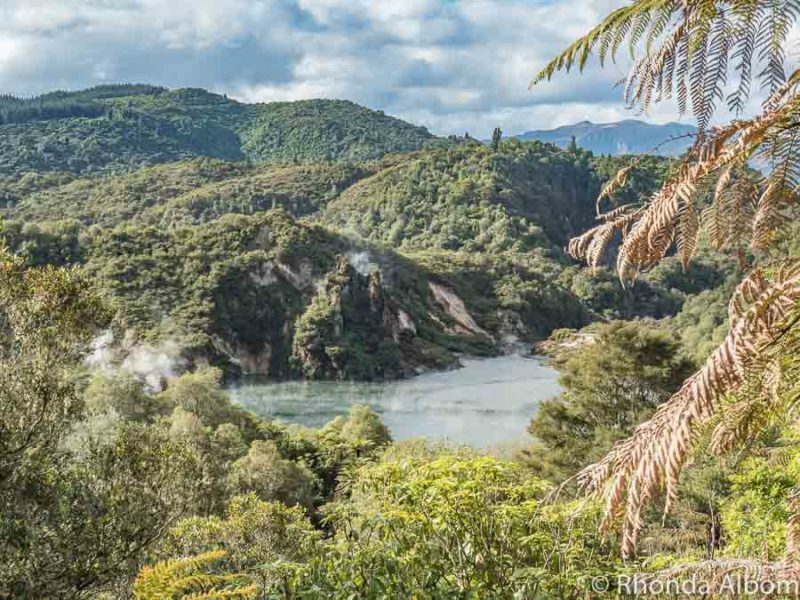 Understanding the history makes the experience stronger, so be sure to follow the Waimangu Volcanic Valley Map and guide that is provided when you enter. 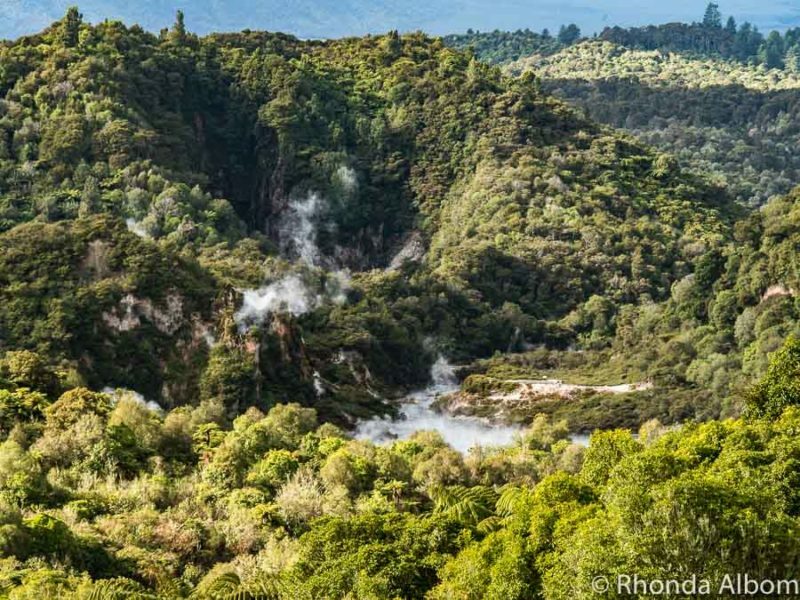 Another panoramic view of the Waimangu Thermal Valley after we began our walk from the visitor’s centre. This is Southern Crater at the end of the rift. The pink algae shifts with the wind. On April 1, 1917, a portion of Echo Crater erupted resulting in the formation of Frying Pan Lake, which is now the world’s largest hot spring. Point of 1973 Trinity Terrace eruption that lasted only 15 minutes, yet sprayed mud over 100 metres away. Cathedral Rocks are estimated to be at least 60,000 years old and are on Echo Crater and Frying Pan Lake. Psilotum Nudum is an ancient fern. 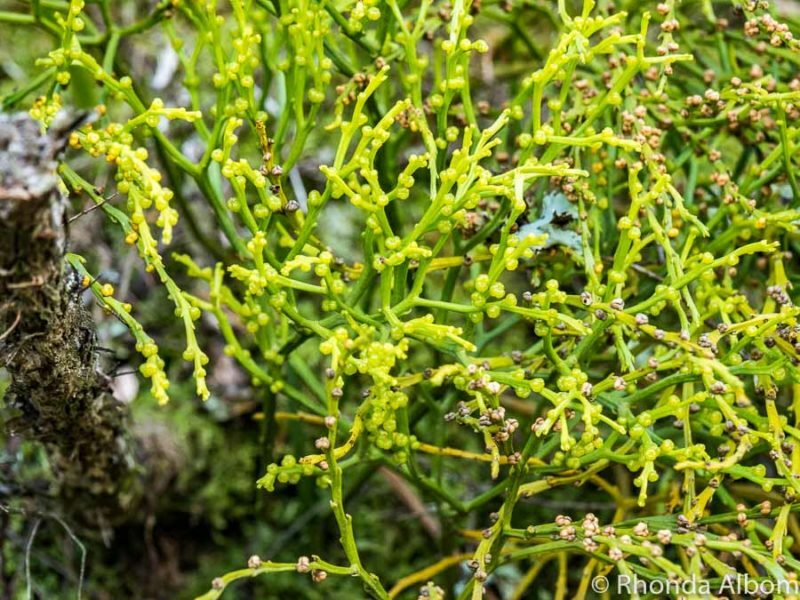 Its spores are amongst the rare flora that was scattered by the Mt Tarawera eruption. Silica terraces were formed by a boiling spring of mineral-rich water in 1975. Notice the large white cross on the lowest point of the crater rim. 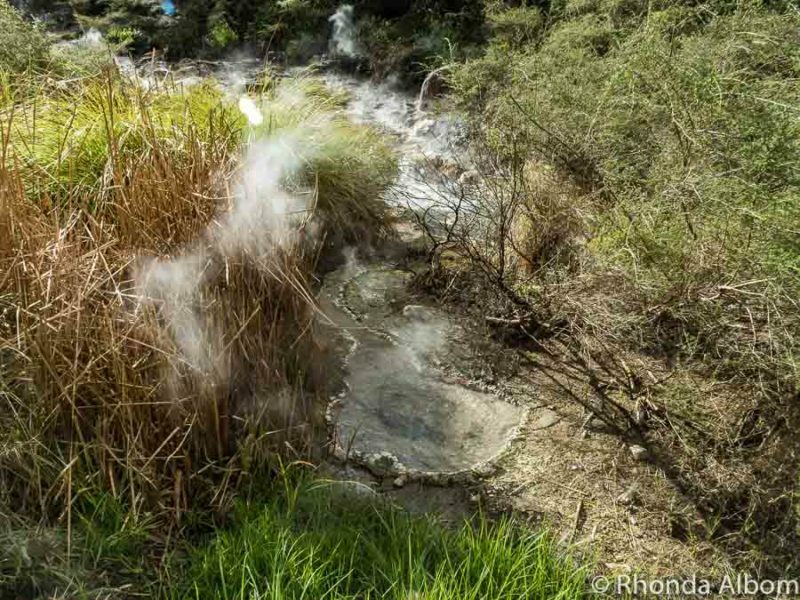 It marks the site from where four tourists were washed to their death in 1903 when the Waimangu geyser erupted without warning. Beautiful Inferno Crater Lake looks inviting, but you don’t want to swim in it as it’s highly acidic with a pH of 3.7. Bird’s Nest Terrace is a colourful example of algae that stick to silica deposits from the springs. Clam Shell Spring holds a bacteria that scientists believe to be similar to the first life on earth. 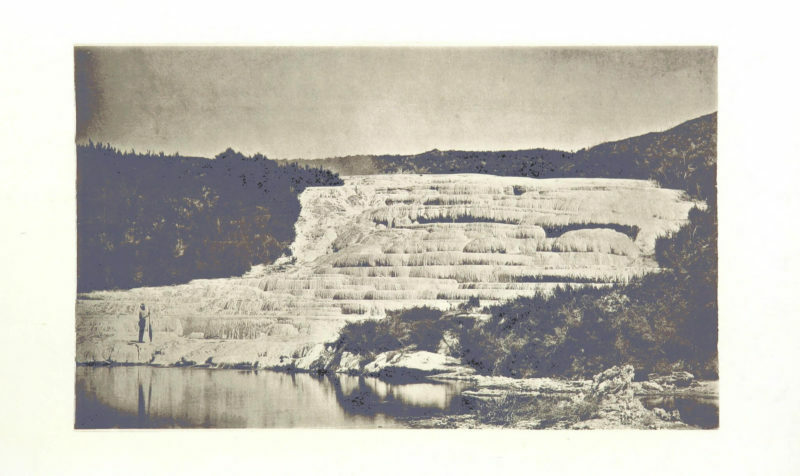 This photo predates the Mount Tarawera eruption which left the Pink and White Terraces under the enlarged Lake Rotomahana. Pink and White Terraces in New Zealand. Photo Credit: The British Library. No known copyright. 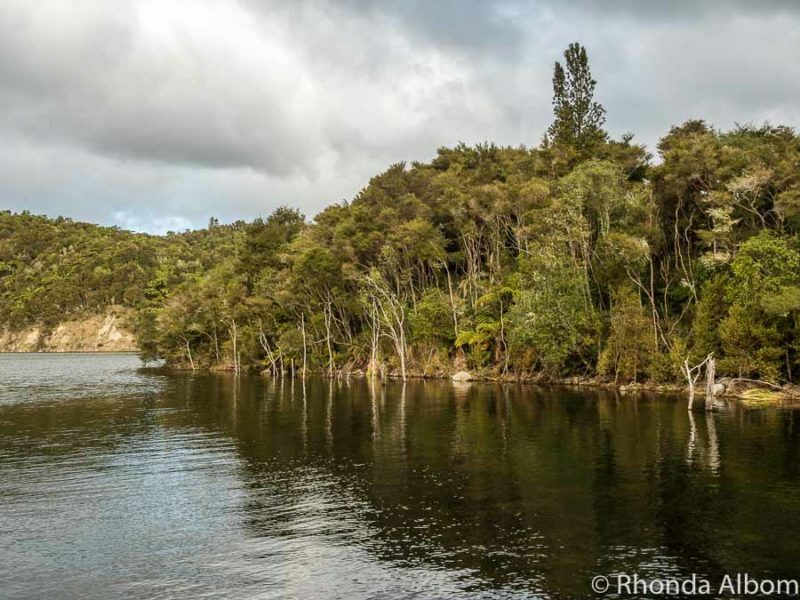 One option available at Waimangu Valley is to explore from Lake Rotomahana via boat. The continuous commentary was fascinating and our captain was available to answer questions. He did point out when we over the Pink and White terraces, now only remnants, fully submerged under 60 metres of water. 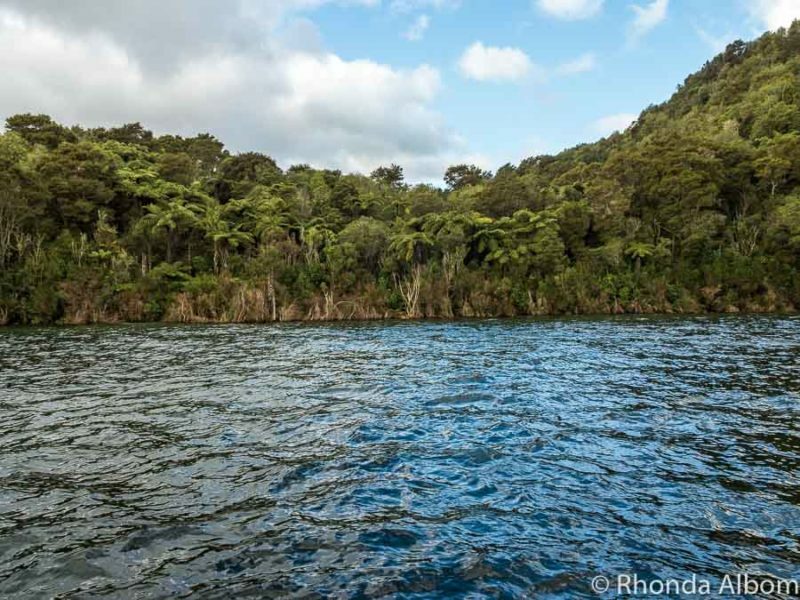 We sailed into Star Hill Crater, another crater lake formed when the Tarawera volcano erupted. This new geyser first began erupting about two weeks before we arrived, and had been erupting every 8-12 minutes since it started. 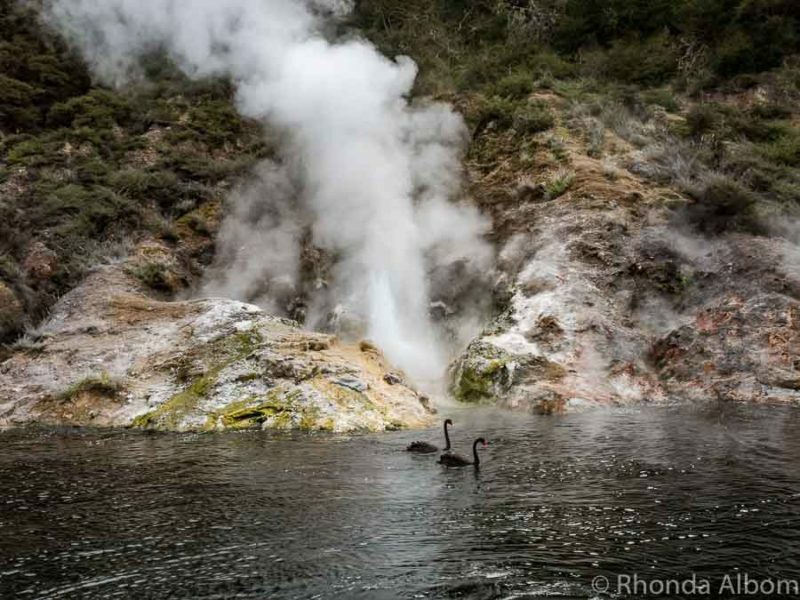 The black swans don’t seem to mind this current volcanic activity. The boat we took out on Lake Rotomahana. Entrance to the Visitor Centre for the Waimangu Volcanic Valley is about 25 km south of Rotorua in the Central North Island of New Zealand. 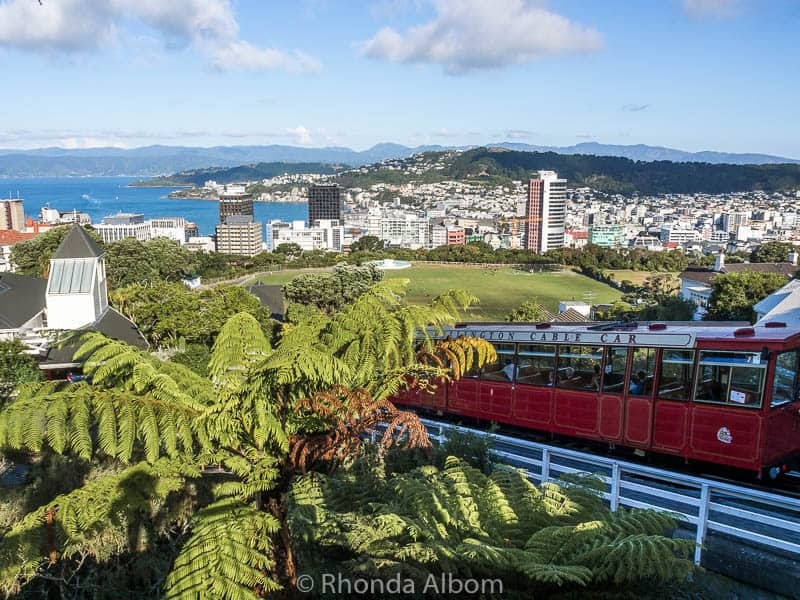 It is a must-see on the North Island. 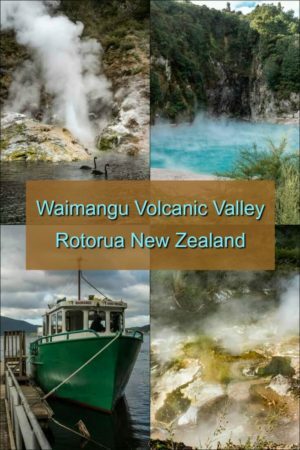 Be sure to pick up a Waimangu Volcanic Valley Map at the visitor’s centre before you set out on your walk, or download a map here. 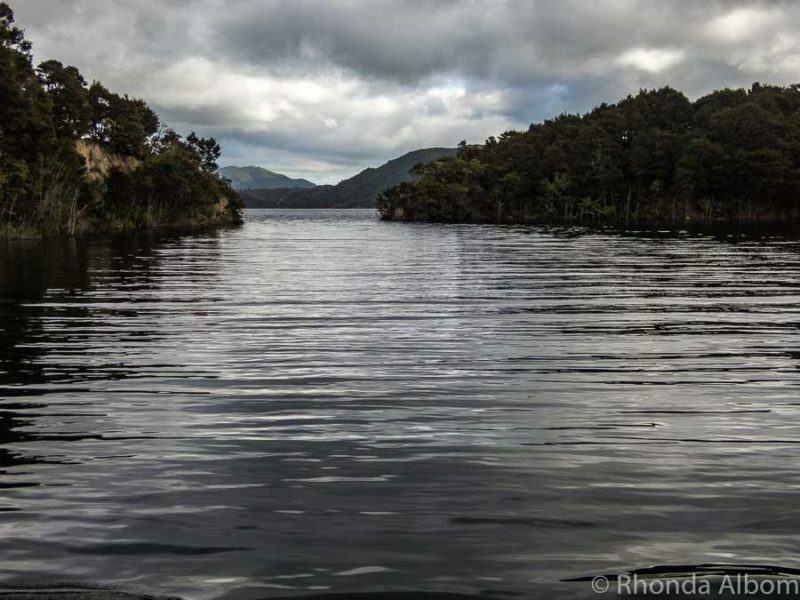 The main walking trail is about 4km and leads from the visitor centre to Lake Rotomahana. If you don’t want to walk all or any of the trail, there is a shuttle bus to the lake that makes several pick up stops along the way. Allow at least two hours if you only want to walk, at least 3.5 if you are planning to include the 45-minute boat trip. There are several walking options as well as a shuttle bus between selected points. We opted to walk from the entrance the 1.5 km to Bus Stop 1 and then take the shuttle bus to the boat dock. 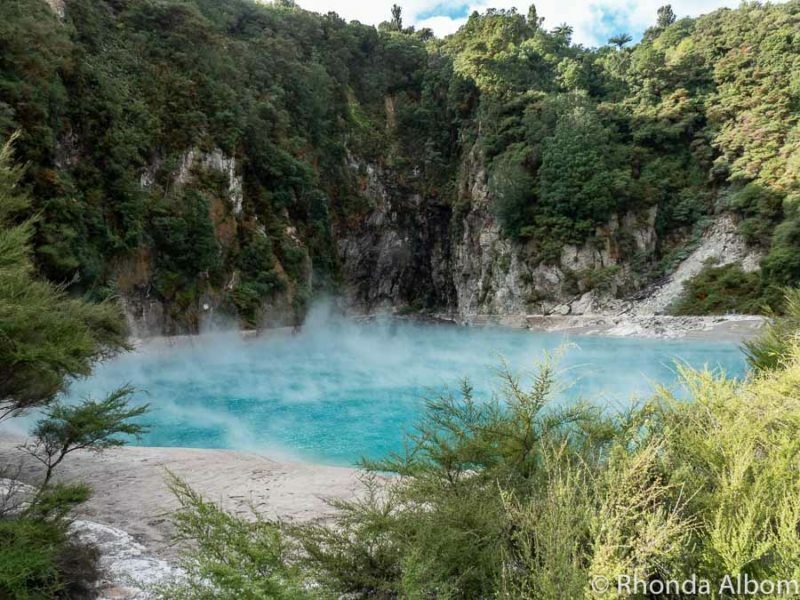 A visit to Waimangu Volcanic Valley is one of several surreal experiences available when in Rotorua New Zealand. 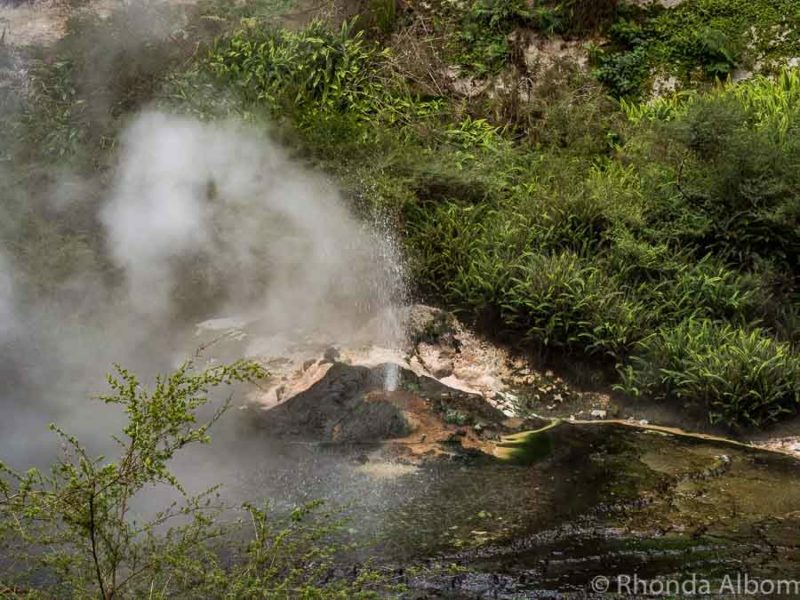 Waimangu is one of my two favourite geothermal attractions. This is one incredible spot to visit Rhonda. I love to see it myself. How long it will take to see all those spots? We were there 2-3 hours but we didn’t see everything. We walked down to the first bus stop and took it the rest of the way to the lake. What a glorious place to visit! I’m sure the boat ride was enlightening..what beautiful scenery! I’m also fascinated by the clam shell area with signs of original life. How cool! Wow…what an amazing place that looks – and beautifully captured! Your country is so beautiful. I hope I will be able to visit it someday. I think the area is under intense study so hopefully they have indications in advance of something imminent but, yes, the thought crossed my mind. I always thought that the volcanic areas in New Zealand look so lush compared to others around the world. They are marvellous photos, Rhonda. Yes, that is one word that describes it. ” This new geyser first began erupting about two weeks before we arrived, and had been erupting every 8-12 minutes since it started. ” Does this mean that eventually it will erupt? This area is so beautiful. Beautiful Inferno Crater Lake is highly acidic with a pH of 3.7. Not know what this means, could explain what pH of 3.7 means to a person like me which doesn’t know hat it means. Thanks Rhonda. See ya. The geyser shoots boiling water out. Anything can change and happen. It could get bigger or stop completely. I think a pH of 3.7 is similar to the pH of soda or orange juice. Wow, this is so gorgeous! These views look like theyre out of a movie! I don’t know if they ever used this particular area for a movie. What a sad and scary event! It’s hard to imagine how horrific that eruption must have been. Makes you feel grateful for the modern capabilities of predicting volcanic eruptions like this. Still, the area looks very beautiful today. I’d love to visit it someday. 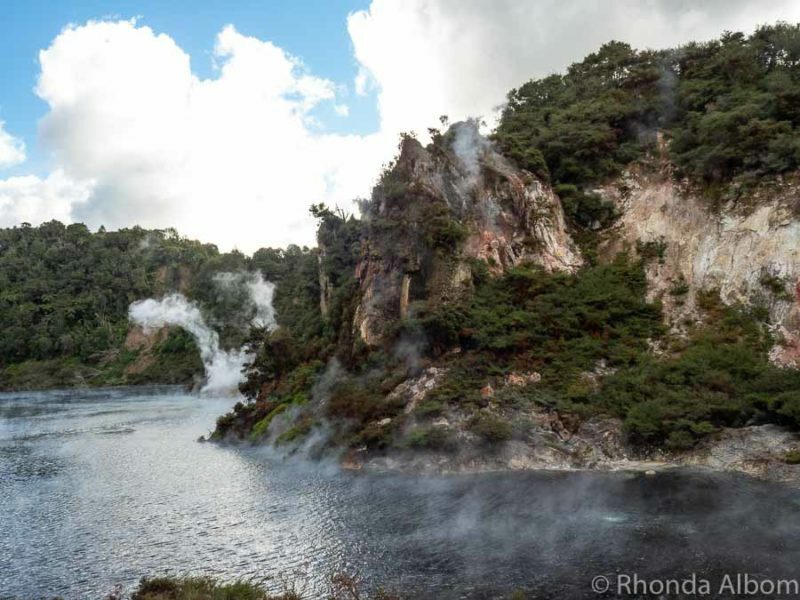 Mt Tarawera erupting was a major event. I guess these sort of things happen when your country lies on the ring of fire. These photographs are magical. Otherworldly if you will. I do know that you’re a great photographer too. It is definitely a see in person sort of thing. The bubbling water and floating steam along with the gurgling sounds of geysers and vents are surreal. WOW this is incredible, amazing, breathtaking and beautiful. would love to visit this spot! ANd it’s always changing. New geysers appear and features change constantly. Wow thats amazing! The water looks pretty but I defiantly wouldn’t wanna take a swim thought haha. It’s amazing how one thing can change everything. That low pH water would make my skin crawl too. Never got around to doing this. Love the colour of Inferno Crater Lake!! Wow this looks amazing! It is so interesting to see ! It is even more interesting to see in person. WOW…these photos are amazing! This whole thing is really quite incredible. It is very incredible, and even more beautiful live. All that beauty from one eruption in four hours time? Wow. 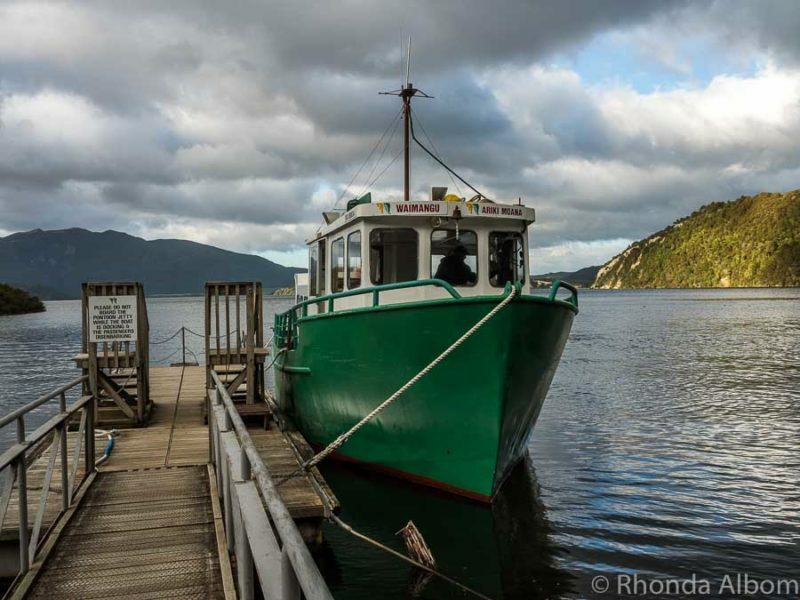 I love the steam on the water and especially love that green boat in contrast to the water. Lovely photos! That’s what I was thinking when I was there. 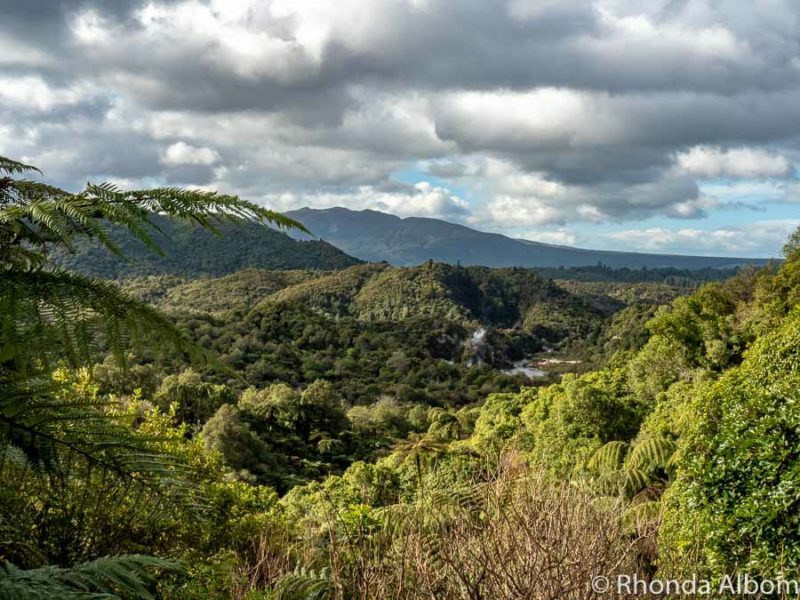 I never tire of New Zealand landscapes Rhonda. Freaking brilliant. Any time I share photos on Facebook from NZ, every one gets pop. Fabulous images! I agree Ryan. I have lived here for 16 years and never tire of it. I remember Mt. St. Helen’s big explosion. (We heard it and got ash all the way in Oregon.) It was amazing how quickly things began to grow again. It must have been pretty scary to be close enough to hear it and get ash. Omg this is amazing!! I had no idea about this place. Might be amazing to visit it in real life. Your photos are incredible! Honestly, I didn’t know about it either, before planning for this trip. And, I live in New Zealand. 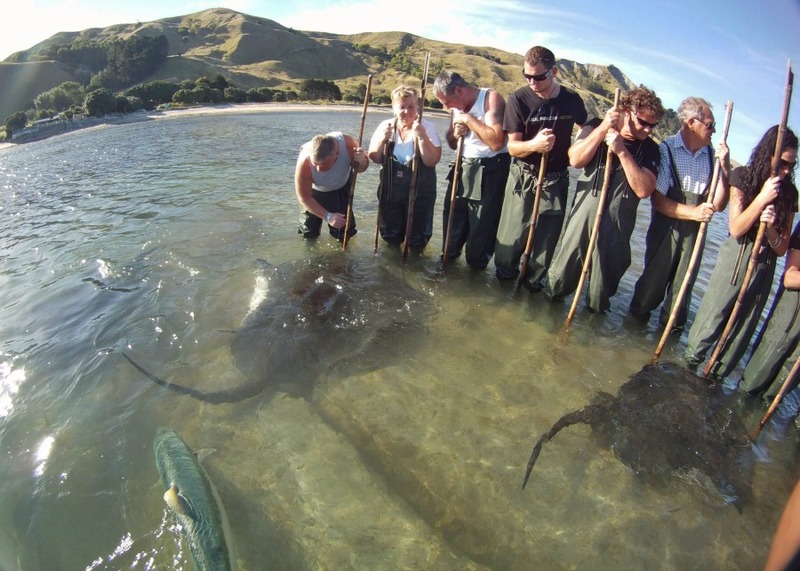 It’s amazing, and should be on everyone’s New Zealand bucket list. Oh wow… These photos are seriously incredible! Your photos reveal what a truly beautiful place this is. They make me want to see it, but I probably will never get there. Maybe one day you will get here. Your photos are just magnificent. I can’t get over the untouched beauty – it’s like something out of a Lord of the Rings movie! Just stunning! LOL – It is in Middle Earth. Maybe it was the inspiration. Yes, Hillary, this is one you won’t want to miss. They are much better at predicting eruptions now, which makes it safer to visit. I wonder how often they have to clear the area? It is quite beautiful. Nature knows how to take back over. Interesting question, and one which I never asked. I am not sure they are always good at predicting, sometimes the unexpected happens, like that two-week old geyser we saw from the boat. Wow! It’s crazy the power of nature! Sad that so many died in this event, but the result is quite magnificent! 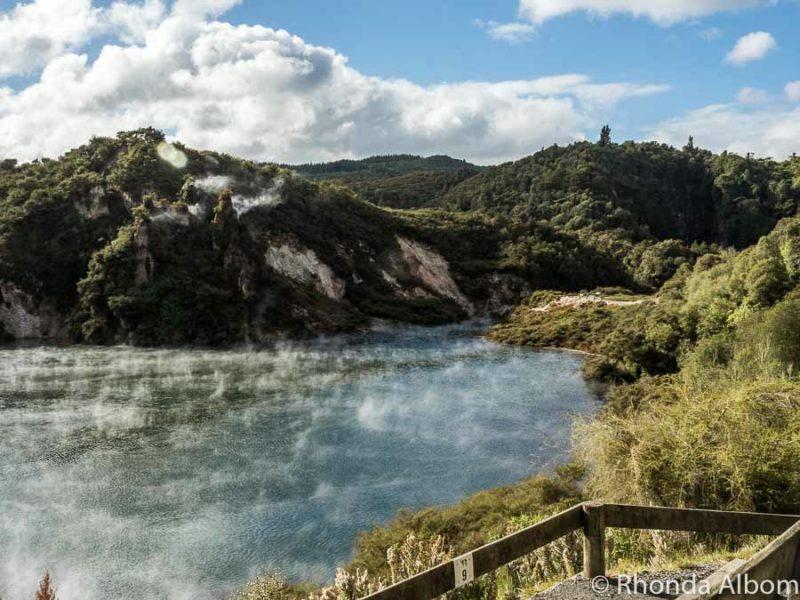 It’s quite fascinating that it’s also the youngest geothermal system in the world! Nature sure is amazing at times, and scary when you think about it.